“Business and technology leaders will continue to face rapidly accelerating technology innovation that will profoundly impact the way they engage with their workforce, collaborate with their partners, and create products and services for their customers,” said Mike J. Walker, research vice president at Gartner. “CIOs and technology leaders should always be scanning the market along with assessing and piloting emerging technologies to identify new business opportunities with high impact potential and strategic relevance for their business.”The Hype Cycle for Emerging Technologies report is the longest-running annual Gartner Hype Cycle, providing a cross-industry perspective on the technologies and trends that business strategists, chief innovation officers, R&D leaders, entrepreneurs, global market developers and emerging-technology teams should consider in developing emerging-technology portfolios.The Hype Cycle garners insights from more than 2,000 technologies into a succinct set of 35 emerging technologies and trends. 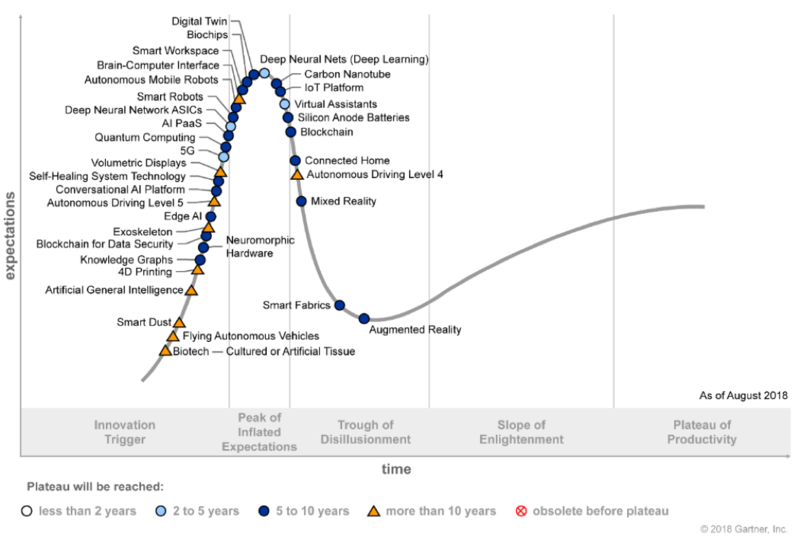 This Hype Cycle specifically focuses on the set of technologies that is showing promise in delivering a high degree of competitive advantage over the next five to 10 years (see figure). Het internet of things (IoT) is voor veel organisaties en CIO’s nog wat diffuus en wordt vaak afgedaan als toekomstmuziek. Toch wordt IoT meer toegepast dan op het eerste gezicht lijkt. De IoT-technologie is inmiddels volwassen, en het is hoog tijd om met IoT-initiatieven te starten.